And here is the cover I've been dying to show you since I laid eyes on it last week! May I present...Mumnesia! by Katie Dale!!!! Isn't it fabulous? This book is Middle Grade and I understand from Katie, that the cover is rather SPARKLY in real life. Completely different from Katie's YA novels! Mumnesia will be published by Macmillan Children's Books on the 16th June. Here is the summary to whet your appetite! Lucy's mum is so out of date she's practically mouldy. She's super-strict, overprotective and won't let Lucy go to the school ball! Lucy can't believe she was EVER a teenager . . .
Until the morning her mum wakes up with no memory of the last thirty years - and thinks she's twelve years old - and that she's time-travelled from the 1980s! And advance reviewers are loving the book! Here is what they had to say. And here's what Katie had to say about the cover! "I am so EXCITED about this cover! MUMNESIA! is my first middle grade novel (and quite a departure from my previous gritty YA novels!) 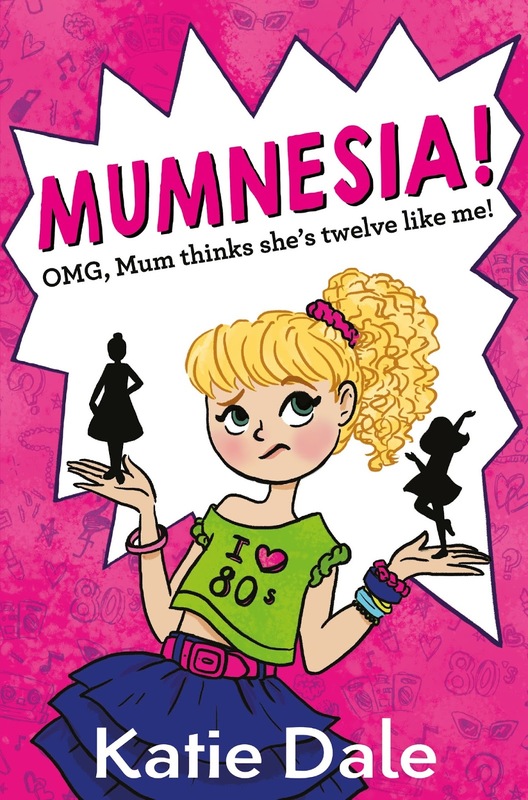 and I'm so thrilled with how SUPER SPARKLY the cover is in real life, and how perfectly it expresses both the fun that ensues when Lucy's mum gets amnesia (complete with 80s makeovers, parties, and bunking off school!) and Lucy's ultimate dilemma, as she literally weighs up the two different versions of her Mum. Which is better: a no-fun, strict, sensible middle-aged Mum? Or a carefree spunky Mum...who thinks she's twelve years old?! I love all the details in the pink background too, as they all illustrate themes within the story - music, make-up, hearts, and lots of question marks - for at the heart of the book is a mystery Lucy and her mum have to work together to solve: What caused Lucy's mum's amnesia? And how will they ever get her memory back?" I am seriously super excited about this book and can't wait to read it!